Tangibl was requested by our client, a transmission owner in the PJM Interconnection, to provide detailed design services for the reconfiguration of a 69-13kV distribution substation. Twelve (12) 13kV distribution circuits emanated from this substation, parts of which were over fifty years old. The circuits were supplied by indoor metal-clad switchgear in the control house and a relatively recent outdoor walk-in metal-clad switchgear assembly, supplied by three different 69-13kV transformers. The project required circuits to be relocated from existing switchgear to three new outdoor walk-in metal-clad switchgear assemblies. In order to accomplish the physical reconfiguration, an existing structure that supported a former 34.5kV outdoor substation had to be removed. The affected portion of the station had to be re-graded and cleared to support the new switchgear in a manner that allowed for new conduit exits from the switchgear to either new or existing manholes. 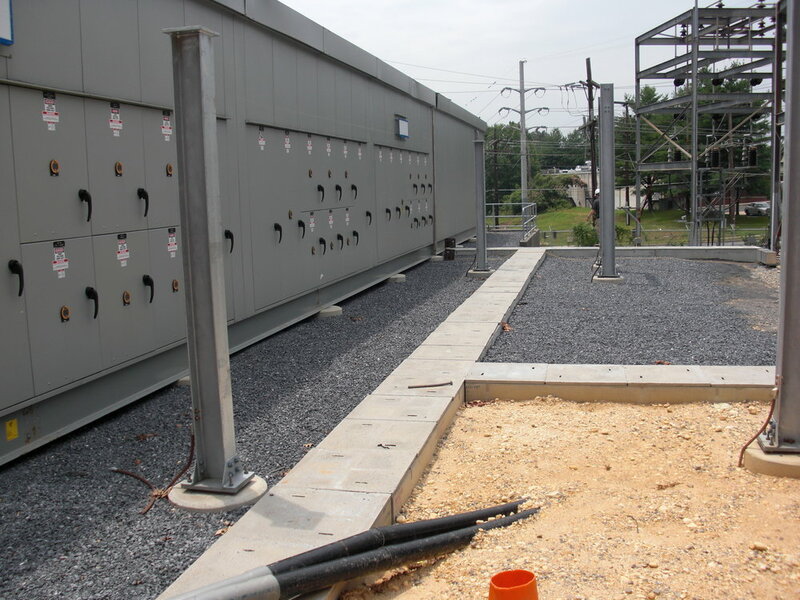 The scope of the physical work required a permit from the suburban county in which the substation is located. The surveying, permitting drawings and forms were prepared under Tangibl’s direction for the client to make submittal to the county. The significant rearrangement of circuits impacted the outside-plant portion of the client’s infrastructure. Tangibl was requested to design the rearrangement of the outgoing circuits, including conduits, manholes inside and outside the substation fence, and new or reconfigured terminal poles and cable risers. The client manages inside plant and outside plant through separate organizations, and Tangibl worked with both organizations to complete both sets of design deliverables. Tangibl completed a series of design deliverables for the implementation of an advanced 13kV loop scheme for a large distribution utility in the mid-Atlantic region of the U.S. The purpose of our client’s program was to increase circuit performance as measured by outage and frequency duration by 1) inter-building solid-dielectric vacuum reclosers with single-phase tripping capability in existing 13kV loop circuits, 2) replacing existing oil and vacuum reclosers with the same type and kind as the new reclosers, 3) integrating the protection and control of the loop at the substation utilizing optical fiber, digital microprocessor relays and make-before-break sectionalizing and reclosing schemes. Tangibl’s original scope of work included a field review to identify recloser locations and make ready requirements for ADSS fiber optic cable installation in the power space on aerial distribution pole lines in the client’s most urbanized operating divisions and extensive permitting support for highway and railroad crossings. Our scope of work was expanded at client request to include substation control house (inside plant) engineering support, specifically from the fiber optic termination point in the control house relay rack to the “Point of Entry” (POE) or demarcation point “as-left” by the operating division engineering staff. Optical fiber runs were primarily aerial, but also included underground runs from certain substations in lieu of aerial runs, and underground runs at major highway crossings. Tangibl’s original deliverable set included the preparation of recloser design drawings, fiber design drawings, construction bill of material for certain 13kV loop circuits in the client’s program and permitting deliverables.The deliverable set was expanded at client request to include detailed isometric representation of recloser installations, ADSS fiber optic cable slack loops, transitions to main line riser poles or “dips” and additional “make-ready” pole-top construction details.Also included were reference drawings, composite work orders, termination details to connect fiber optic cable to ALS equipment and joint-pole-ownership documentation.Tangibl provided field support for the construction of the advanced loop scheme and prepared final drawings to represent as-built conditions in the field.